Intex which is well known for this gadgets on speakers and Mobiles now came up with Intex Aqua Selfie Smartphone, whose cost in Indian mobile probably would be 6,649/- Rs this is a 4G phone so a mobile in this range with 4G supported is good enough to attract users,below we will look at what will be the features of Intex Aqua Selfie which is available for this price Range. Also Read about Reliance Jio Phones may cost Rs 500/- 4G. 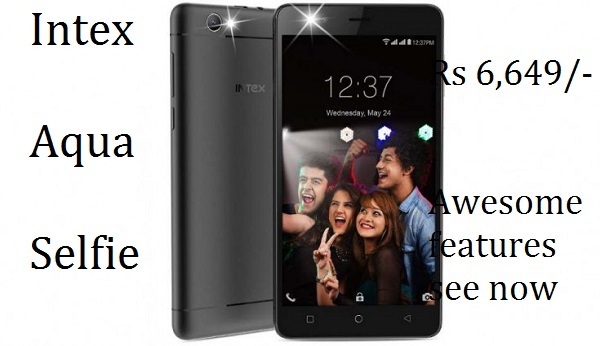 The first and foremost advantage of this handset from Intex is its price,very affordable to buy because this is a 4G handset VoLTE and it comes with 16GB internal memory which is good enough in this price range and a decent camera features of Intex Aqua Selfie.